Hi there play aficianado, let me introduce myself and how I came to be writing stories and curating information and images about playgrounds and play. My given name is Alex Smith but just recently I’ve decided to go by an alter ego – Mr. PlayGroundology. I’ve taken to this renaming for a couple of reasons. First up, Suzanna from over at Pop-Up Adventure Playgrounds has been calling me that for the last little while and it has started to grow on me. Secondly, I hope it is inviting and playful and will give visitors pause for just long enough to consider clicking through the tab to see what’s inside (like you did perhaps). 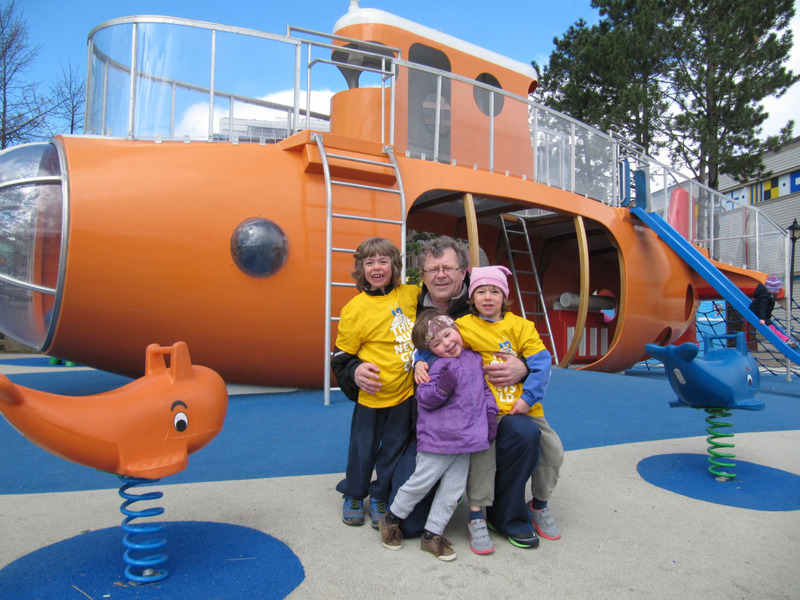 Playgrounding with our kids at the Orange Submarine on the Halifax waterfront. Photo credit – Vincenzo Ravina. 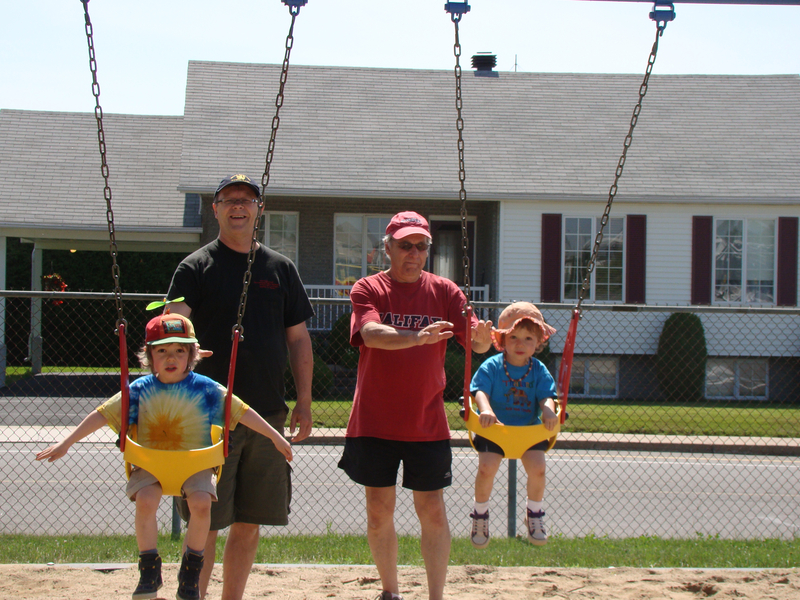 Now about the playground thing, my father-in-law Raymond, three young kids in perpetual motion, a delicious 6-month parental leave and the Town of Sorel, Quebec introduced me to the playground trail in 2008. Raymond, a former PhysEd teacher knew all the best playgrounds in town and was only too happy to introduce us to them during a leisurely summer visit. We had lots of simple, squealing pleasure – fun on swings, slides and springy, climby things. It was all good to the last cry of ‘higher, higher’, or ‘catch me’…. Not only did Sorel have a lot of hang out, fun playgrounds for us but the town also listed them and provided their civic addresses on the their website. A quick check on the City of Halifax’s website showed no playground web presence. I thought a blog with photos and a Google map might have some legs and get me playing with social media. 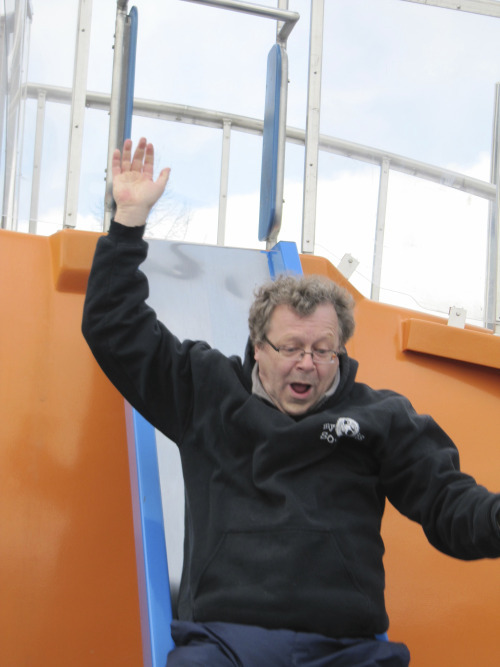 We got underway the next year and had a blast visiting playgrounds around the city. By the time that this local blog got eclipsed by PlayGroundology, we had visited and played in more than 60 of our hometown playgrounds over a period of three years. Not even halfway through that first summer of local playground blogging, I was beginning to see that there was a whole lot more to this world of play than I had ever imagined. Those who love play love it a lot and I was quickly becoming an adult convert. It was wonderful to see people from many professional and societal backgrounds engaging in impassioned actions to promote the universal nature of play. There is a richness to discover everywhere that playing children are left to their own devices. This can be more pronounced in those spaces where adults have demonstrated empathy by taking the time, care and knowledge to create environments that lend themselves to adventure, exploration and the redefining of limits. I wanted to learn about all those wonderful people who were designing great spaces for kids, who were encouraging communities to reconceptualize public play spaces. So in January 2010, I published my first PlayGroundology post on Tom Otterness’ Playground aka Manhattan’s Bronze Guy. I don’t really think there could have been a more apt beginning. Five years, three hundred blog posts down the road, meet-ups with play people and good fun with my kids – it’s all a bit of an accidental dream come true. I have met fine people in Halifax, California, British Columbia, the Isle of Man, Scotland, England, Australia, New York City, Singapore and many other places. Without exception they have introduced me to new facets of the play dynamic. These fellow play enthusiasts have also inspired me to go beyond the digital page and help create some play moments in my community. Watching kids play, making it up, creating their space triggered some very powerful emotions. It was joyful to see and hear, exhilarating to have helped make it happen. More on loose parts play. I have come to the conclusion that I’m in this for the long haul. I hope some of you will join me on occasion, drop in for a story about play. Many thanks to readers for their comments and suggestions. I am always open to guest bloggers, writers and photographers. Before discovering this play vocation, I tried my hand at a number of things – an accidental farm labourer, glass factory box maker, a canada world youther, bilingual dishwasher, historic log church site refurbisher, demolition labourer, steward for the captain of an icebreaker, street theatre player, peace movement youth exchange coordinator, daycare and elementary school teacher, film festival publicist, unilingual dishwasher, proofreader, freelance broadcaster and writer, church and house painter, paper boy, tree planter, untested and unrequited poet, insulation installer, arts and culture administrator, weather data for broadcast seeker, technical translator, mopper of decks and cleaner of heads, built heritage researcher, conference centre cleaning and cooking staffer, national association communications director, federal and provincial public servant, night watchman in a small town park/playground. Listen to ‘Just Play’ on audioBoom. This Dad and play gig is really just too sweet to slide into. Your daughter was my wife’s student at NSCAD. She asked us to send you a link to our website. Just stumbled on your blog and have spent the last hour here! Love your work… if you ever hit Australia, I’d love to be your playground tour guide! Rebecca, I hope I’ll be able to take you up on the guide offer some day. I’ve always wanted to visit Australia and I understand there are some great playscapes there. Tell your friends about PlayGroundology and see if they might drop in for a visit too. Great to hear from you and thanks for the kind words, they’re always encouraging. I have also stumbled upon your blog and am very interested in what you have to say. I work at a Children’s museum in the UK so I like to look at how things can be better designed with children at the very heart of the process. Will be keeping abreast of your blog for insights! Spookily enough it’s Halifax in the UK that I write to you from 🙂 One thing I am currently planning to undertake is using a point of view camera fitted to a child’s head to get a better perspective on how they see and interact with their play space! Camera is on order and volunteers at the ready. Thanks for your interest. I’d love to see what kind of footage you get with the mini-cams. Will you take the kids to a playground? I’d thought of this also but don’t have the equipment. Is it inexpensive to set up? Please pass on the blog to others you think may be interested. Say hello to Halifax on the other side of the pond for me. What kind of work do you do at the museum? Just had a test run today and the quality of the recordings is brilliant. No, not to a playground it’s being used initially in one of our indoors galleries to help in it’s re-design, so I’m pretty excited about it. The camera is an extreme sports one so it would be interesting to see how it fares on a child in a playground but I would imagine as they are used for snowboarding then it should do the trick. This one worked out at about £130 but also need to buy an SD memory card. Not sure how that converts currency wise. It is small but is a little heavier than I anticipated so it’d be for the older age range at Primary schools rather than the little ones. A big hello said to the chaps and ladies of Halifax. I am an Enabler so, a Play Worker with bits of other things thrown in. Currently doing work around the ‘Loose Parts’ concept which I’m enjoying. We have a series of interactive exhibitions from a car garage, a bank through to specific sensory areas for the little ones. Also do educational workshops at local Primary schools. I love my job. Would be nice to get paid more but ah well! Let me know if you put your footage up somewhere – I’d love to take a peek at it. Is an Enabler a job title? It’s great to love your job. There are plenty of people who can’t say that. I love playgrounds and getting my kids to them – the more creative the design the better. Although in Scotland, perhaps Glasgow has found your “true park utopia!” Recently opened, The Forgotten Island is a fantastic space to be explored by children and their families! It boasts Glasgow’s only outdoor beach as well as a labyrinth, “Museum of Curiousities”, Paddock Gardens, a Rainbow Field – where you can create real rainbows and a Sound Forest (where you can pedal on bikes to make music) amongst many more things!! Check out http://www.theforgottenisland.com for more information! My folks are over in Scotland now as we speak on their annual holiday. Mom’s from Greenock and Dad from Port Glasgow. I spent some time there as a wee boy (even left with a Scottish accent 🙂 and as a teen. Sounds like a good story idea. I’ll look at the site and then get in touch with you. I wouldn’t actually be able to publish something until the end of August. Thanks for thinking of PlayGroundology. How goes your internship? The Forgotten Island looks like a fantastic idea! Think it’s time to take a trip North of the Border with my little ‘un. Xelaboy, camera recordings done. Woo hoo, need to go through the footage now. Will let you know what I discover! Alex, The internship is going well thanks. Busy but good! Tell your parents to come for an island visit! August would be great as we are still open until September 18th. Squirrelfist – Your wee ‘un would LOVE the island – I’m sure of it! And the rest of Glasgow is such a great place as well – hopefully we’ll see you soon! They’ve been up to Glasgow but not to the island, Maybe another trip, should the island rise again. I went through the site a few days ago. Love the intersect of art, design and community engagement. What are the primary ‘play’ components? I hope Squirrelfist takes a run up north of the border to take it all in. Hi. I came across a fantastic list of children’s playgrounds in Paris a while back (on scribed), and wondered where you had found this. We have a toddler and it would be so useful on our trips to Paris. This is really a Quebec thing. I have not heard of it anywhere else. Congratulations for your blog, really glad we came across it and we’ll sure return. Feel free to check our our website too, we hope its worthy of People and Places you like. Hi, i recently discovered your blog and facebook page and i spent an hour there. It’s a great source of inspiration for those who work in the playgrounds area. Also in Romania we have original and multifunctional playgrounds, and our company go in for arrangement, improvement and planning playgrounds. I hope our blog https://www.loftrek.ro/blog it will be inspiring for romanian readers, and why not,for all those interested in this wonderful area.You could also check out/like our facebook page https://www.facebook.com/loftrek, where we post frequently new materials about playgrounds. A big heloo for all. Hi, thanks for getting in touch and for the kind words about PlayGroundology. I see from visiting your FB page that you have a lot of people interested in your work in Romania. I’ll be sure to drop in on your sites to see what’s new. Hi Mr. Playground, we run a playground in Switzerland as a community of parents. It is a really nice place with a lot of Green space to run around and Play and be a child. Now the City needs Space for Sport areas and it may be that wie get a much smaller Place as alternative. 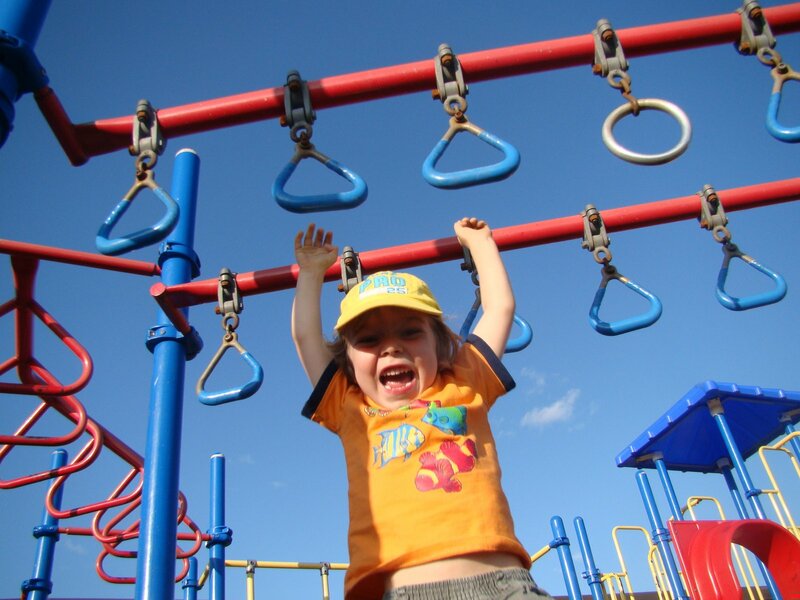 Do you maybe have a link to a study or another source with an recommanded size for playgrounds of a healthy development of children. It would help us a lot for the hearing. Thank you for your help. Geetings from Switzerland. First of all I have to say I’m really impressed. Your blog is awesome i spent more than 1 hour just reading your reviews! Second, I would like to introduce you with Beam, The interactive playground. We have just launched Beam in Canada and the feedback is great! I’m looking forward to know what are your thoughts about it? I was wondering if you knew of any traditional roundabouts in the GTA area?